It’s been a while but it’s still one of my favorite holidays of the year! The idea is simple. 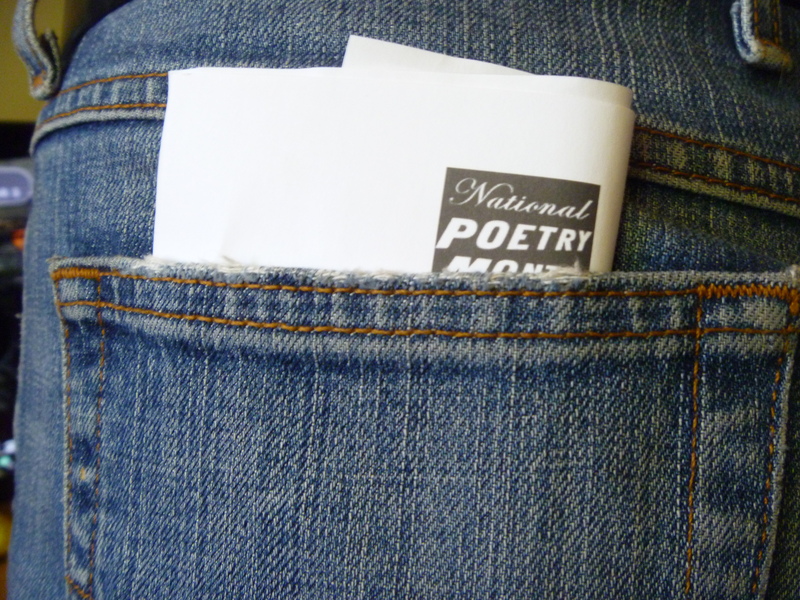 Find a poem that you love or one that makes you laugh or something that conjures up wistful memories. Write it down. Put it in your pocket and throughout the day, share it with your friends and your coworkers and the people in line at the coffee shop and the students in your class and your family at the dinner table and whoever else you come into contact with. It’s National Poetry Month. Read poetry. The kid I have left at home has to be back in school in 6 short weeks. We have downloaded the reading list and he’s had 2 weeks at rowing camp. We are in the sweet lazy days of summer with an unstructured homework-free schedule. 1. Eating together enables you to pass along your food philosophies to your children and others. You can converse about eating locally and seasonally and the benefits of both. 2. Dinner conversation is important whether or not it is about food. Researchers at the West Virginia University Extension found that children increased their vocabulary at a more rapid rate when dining with their parents. 3. The same study found that children are more likely to incorporate fruits and vegetables into their eating habits than if their families ate meals on the fly. 4. A study from WebMD revealed that adolescents who had family meals at least 5 times per week were more likely to receive As and Bs than their colleagues who did not. 5. The same article advocates for family meal time rituals because of the studies that point to kids who are less likely to do drugs or get depressed. Check out the additional reasons for creating a family dinnertime! 6. Another piece of research claims to have conducted regression analyses on a myriad of factors from a population of Rhode Scholars. Although, I am not able to source it, the single common variable identifying them as a Rhode Scholar? Their participation in family meals. 7. Eating together allows the opportunity to prepare a meal together giving the life skill of cooking and perhaps mastery of a few recipes. 8. Family dinner does not have to be fancy or predictable. How about a picnic on the lawn after a swim meet? What is predictable is the routine of having the meal and that can give children a sense of security that builds confidence. 9. Family meals give us the opportunity to raise more considerate children. Through meal guidelines and the enforcement of manners, children are prepared for dining out at the homes of others or in restaurants. Make a list of your basic dinner rules such as using please and thank you, saying a dinner blessing or no television. Break up the chores such as setting the table, filling water glasses or cleaning up afterwards. 10. If dinners are truly difficult due to varying schedules and availability, try breakfast together each day. Set up a schedule in advance so that everyone understands when they’re expected to be home for meal time. The real benefit of holding this ritual is that it becomes part of the definition of your family. It can build a loving trusting relationship amongst you and your kids and between your children. Eating as a family can be an unfamiliar transition for busy parents and kids who don’t do it regularly and are used to eating on the go. If your family is trying to create a new tradition of gathering around the table for meals, one of the biggest challenges parents may encounter is keeping their children comfortable enough to sit still for the duration of a meal and conversation. If your children are fidgeting throughout meals, it may be worthwhile to consider dining sets with an aligned seat to table height ratio. What tricks and tips do you have or need that enable you to hold regular family meals? In our high stress, fast-paced world, getting a good night’s rest becomes increasingly more difficult every year. If there’s one room in a home that needs to be stress-free, it’s the bedroom. Good design can and should support the main purpose of any room but especially the bedroom. While today, many people focus on purchasing a comfortable and budget-friendly mattress, the bed is only one element in the design. One of the latest and most livable design trends brings natural greenery indoors to create a luscious oasis where you’ll love falling asleep. There is a connection between stress and nature. Being in nature, whether that’s a walk in the park or a stroll on the beach, naturally brings down your heart rate and reduces stress hormones. The sounds, smells, and colors all give your brain the relaxation signal. A natural environment also aids in recovery after an illness. Many hospitals now put time and effort into designing attractive outdoor spaces for their patients. Not to mention the fact that plants release oxygen and absorb biotoxins, improving air quality. Plants in your bedroom can provide many of the same benefits as a walk in the forest. Spider Plant: The spider plant grows quickly and loves wet environments. It does an impressive job of removing carbon dioxide from the air. Snake Plant: This plant is more than attractive leaves. It takes in carbon dioxide during the day and releases oxygen at night, making it the perfect addition to a healthy bedroom environment. Peace Lily: If you want a conversation piece, try a peace lily. It’s bright white color obscures the many benefits it has such as removing benzene, acetone, and alcohols from the air. Dragon Tree: Popular in offices because of its size and appearance, the dragon tree also keeps xylene released from car exhaust, paints, and cigarettes out of the air. It’s a low maintenance option that has big benefits. Bamboo Palm: This little plant releases a lot of moisture into the air so it works well in arid climates. It’s insect resistant and easy to grow in shady areas. There are many other plants that work well in the bedroom. Consider the climate and design of your home before choosing plants. Some do well in direct sunlight while others prefer shady spots. Some do better in high humidity while others can’t take much water. Look for plants that appeal to you visually and require the level of maintenance you’re willing to put into your weekly routine. Varying Heights: Plants of varying heights take up vertical space and add visual interest. This method works well in an empty corner where you’re not likely to place anything else. Plant Shelf: A floating shelf with several small potted plants adds ambience in the right bedroom. Living Walls: Living walls are a relatively new concept to home design. A box of mature plants already planted and intertwined is attached to the wall. Not for the faint of heart, these walls make a statement, yet require only basic maintenance. Adding plants to your home and specifically to your bedroom may improve both the air and your sleep. Thanksgiving has always been my favorite holiday; family and friends, good food, fellowship, no gifts.I think it’s that last piece that I find so freeing. I’ve never been a good shopper, don’t enjoy it as a way to socialize – heck, just ask my family – when they do receive gifts, sometimes they’re not even wrapped! With every phenomenon there is hype and inevitably, the media will exorcise the most vile, painful occurrences and report them. Car accidents, muggings, and other inhumane actions occur all the time. It’s just that in the past couple of weeks, they have been the result of a few inattentive or too attentive Pokémon Go players. Some of us are led to believe that this is a crazy, unsafe fad. In my grandmother’s kitchen there was a gadget for everything. Can’t retrieve the pickle from the bottom of the jar? Use the pickle poker. From lemon squeezers to cherry pitters to olive forks and corn handles, there was a specific use for everything and the appropriate sized baking dish to accompany it.